Hearthstone custom mission: The Perplexing Pumpkin Predicament of Farmer Bunce – AiPT! Farmer Bunce’s life of bucolic bliss is disrupted when his prized pumpkin is stolen from his farm one night. Farmer Bunce shot up in bed from a deep sleep, bald head sweatglossed in bands of iceblue moonlight. Through the warped glass of his bedroom window he could see someone, something scuttling from his property in fleeting silhouette against the shimmering moon. It paused to look back at him, perhaps aware of his gaze. Bunce saw it clasp something watermelon-sized in its hands, rearrange its grip, then disappear into folds of shadow. A moment later Bunce came sprinting from the front door of the farmhouse in nothing but his socks and underwear, pitchfork held alongside his head in an upright palm like a javelin. His long, white beard wisped on his bulging neck as he hurdled a split-rail fence, rushed past a rusty chickenfeeder, a slant-roofed, wooden chicken coop, then cleared through a brood of hens who clucked and scattered in a flurry of white feathers. When he got to the metal wire enclosure, the sign which read “All trespassers will be shot, go on test me” had been torn down. A trio of truesilver locks reeled like cracked acorns by his feet. Bunce swung open the warped front gate in a panic, looked at crater in the steaming farmsoil where his enormous pumpkin sat only minutes before. He spat. When Farmer Bunce and his son reached Knottley’s farm something reared up out of the dark in front of them from within the pipe fencing and let out an angry cry. They fell back, tried to discern through the rags of kicked-up dust the source of the high-pitched squeals and pounding hooves. Farmer Bunce and his son laugh. Growth cards include Wild Growth, New Growth and Old Growth cards. Nottley passed his hand over the top of the pumpkin like a baptismal priest. He caressed the rind. The pumpkin let out a pneumatic hiss, leapt from Nottley’s hands into a nearby tangle of vines; it quivered in them until they too came alive, cocooned him in their slithering embrace, materialized a torso and arms and legs on which it finally reared before them towering and baleful and vaguely humanoid. Minerva starts with two Witch’s Cauldron minions on the board. 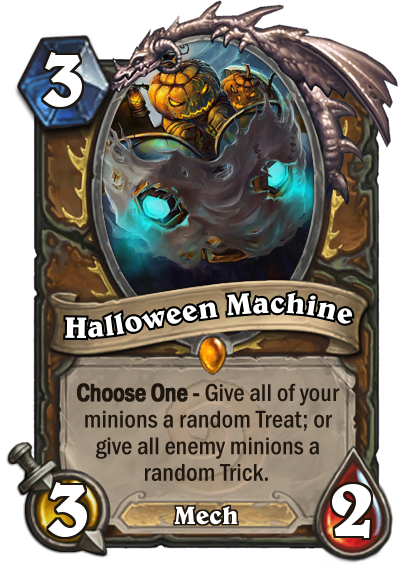 Inspiration for Cormac van Pelt’s Trick cards: Halloween Machine by Custom HS user: Murghlinwall. I did my best to give credit to all the cards I used in this custom mission if I didn’t create them myself, so if I missed any, feel free to drop me a line at my e-mail and let me know. Comments/constructive criticism welcome as always.